Books XI-XIX (= volume IV) of Maimonides halakhic codex Mishneh Torah. Books X-XIV (= volume IV) of Moses Maimonides’ halakhic codex Mishneh Torah, copied by Barzilay b. Jacob Halevi for Joseph b. Abraham b. David. Ownership inscription on f. 2r of both volumes: מרדכי מבוטריו [Mordekhay of Buttrio]. Narbonne, 1282. On the first f. of vol. 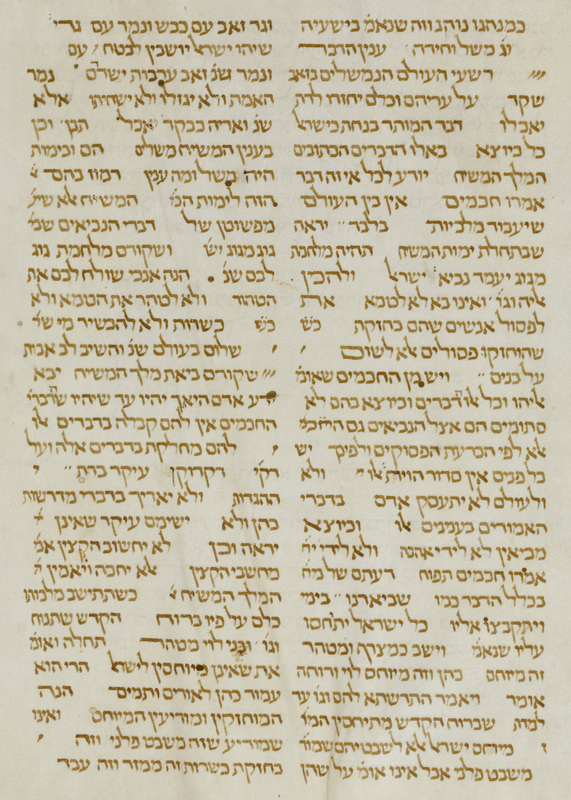 III a vellum leaf is pasted with the title: ספר עבודה / קרבנות טהרה in large, square writing in blue and red ink, within an ornamental frame; on the first f. of vol. IV a similar leaf can be found, bearing the title: נזיקין / קנין משפטים / שופטים The beginning lines of vol. III and vol. IV are written in an ornamental coloured frame and laid in with gold. In vol. III and vol. IV some lines have been erased. At the end of both volumes a Latin inscription has been added by the censor, D[ominus] Jac[obus] Geraldini, dating 1555. Hebrew / Vellum / 31,6 x 24,1 cm. approximately / 2 parts, being vol. III and IV / Vol. III: , vol. IV:  ff. / Square Provençal writing with annotations in the margins, in the beginning some pencilled notes by J.L. Palache in 20th century Sephardic cursive writing.